This is an excellent book for a small group Bible study. Lots of great information, easy to teach, and fun to read. There's a good amount of history without being dry and a fair amount of humor as well, which keeps what could be a tedious topic light-hearted and engaging. I'll totally use this book the next time I lead a Bible class. This is a great introduction to the Bible. Their writing style is very conversational and easy to follow. They do a fabulous job of explaining how the whole Bible fits together. I highly, highly recommend this book to anyone who follows Jesus. I picked it up after I'd been studying the Bible for years, and still found the information very helpful and clarifying. We are never too far along in our journey to pick this book up. This book was great. It essentially goes through the purpose of the Bible, the history behind it, it's validity, and then summarizes it book by book in casual terms. The authors' writing style was engaging and conversational and made me smile and laugh occasionally as they outlined every highlight the Bible had, with loving humor at times. If you have studied the Bible in an academic setting at some point, this is probably not the book for you. But for anyone else, this is a fantastic book. I think it is particularly good for anyone who is very unfamiliar with the Bible or is not a Christian and is interested in getting a summary of it. However, not being a Biblical scholar but being someone who had studied the Bible extensively on my own, I actually really appreciated this book and I actually learned a lot and appreciated how the authors went about presenting His Word. There were a lot of points they made, particularly regarding the Old Testament, that I had missed in my own readings of the Bible. Most importantly, they presented His Word faithfully particularly focusing on what was most important: that every story centered and culminated on the coming of the Savior Jesus Christ, His death and resurrection, and His Second Coming which we are now waiting for. These authors are not Biblical scholars, which I actually appreciated (they are a lawyer and a businessman who seem brilliant and have studied the Bible on their own time), but they are definitely the real deal and know the Gospel. They present it in a great way to make this resource worth anyone's time. I definitely recommend it! I enjoyed reading this book. It was an entertaining breakdown and summary of the Bible. We read this book as a small group in our church... it has some interesting bible trivia-type facts and the authors are quite conversational, but we found it to be EXCRUTIATINGLY simple. We decided that if you're completely, totally, brand-new to the bible (like never opened one before), and if you're NOT skeptical of Christianity, that this could be a useful book for learning more about the book called The Bible.As veteraned believers and all around churchy-people, we found ourselves debating some of what they said as being on the fringe of theologically, um, omissive, for lack of better descriptive. We had to cram the last 4 chapters in all in 1 week so we could finish on time to join a whole-church study. The chapters we gave only a fly-by were the ones we enjoyed the most. We decided this is a book to read at 30,000 feet. The fly-by view is great. WARNING: NOT for the armchair theologian. If arguing semantics in your small group floats your boat or you are "churchy" by self-description, then just back away and get back to your Greek lessons. This book gives an excellent overview of scripture, especially for the new or young believer. 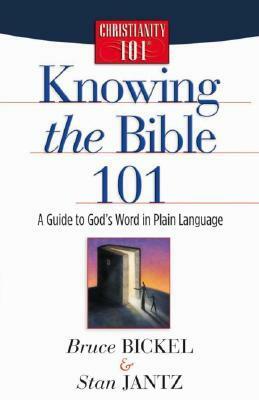 I use it in my homeschool with my 9th graders, just to make sure they have a solid introductory view of the Word, but I would not hesitate to give a copy to anyone even remotely interested in learning more about the bible. Readable. Understandable. Outstanding. We are using this for our small group study. If you are not familiar with the Bible, this is a good summary to start with. The authors do a good job of approaching a serious subject without taking themselves too seriously. An easy read. I love the entire Christianity 101 series and this one in particular is a great foundation to have on hand. I can see where I'll have this always on hand to turn to when I have any questions during my Bible study. I read this in two hours and didn't learn a thing. BUT this book is great at what it does. It is an excellent introduction to and overview of the Bible for those who know almost nothing about it. Well written. little remedial at points for my taste but good overview esp for those new to The Book. lots of nuggets of insight sprinkled in. Very handy guide to knowing the books of the bible simply and easily. I enjoyed really this immensely. I learned alot and look forward to reading the rest of the work in the series. heel leuk om te lezen. En handig! Maar het komt niet hierdoor dat de Bijbel me gaat aanspreken hoor :) het maakt het in de context begrijpbaar. Good book for new Christians, informative and easy to read, packed with good information, reading lists, and study plans. this is an excellent book to have & to keep as a reference. Very easy read. Bible 101. Would be great for a new believer. Great book for a new Christian, or one wanting a brief overview of the bible. Informative, engaging, and concise.